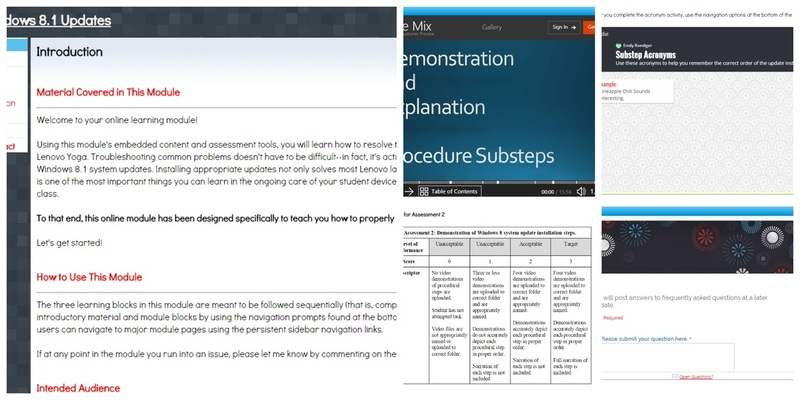 I partnered specifically with my school's technology department to design and create my online module. Together we identified a procedural deficit in our technology club students and discussed possible solutions. The eventual result was an online module that taught these already tech-savvy students how to install Windows 8.1 updates properly on school-issued laptops as a way to fix and prevent common errors. I created the actual module and its content, but I worked closely with our technology integration specialist throughout the process to make sure this online module was successful. Even though most of the instruction I deliver isn't online but face-to-face, partnering up with another educator on campus to address a need was a useful way to learn those collaborative skills. Click the image below to view the full online module. I partnered with an 8th grade English teacher to design, teach, and evaluate this collaborative lesson on credible sources and ethical use. This teacher had recently assigned a large project on Georgia authors. Students are required to choose an author with Georgia ties, conduct research on this author, read a sampling of the author's works, and produce several artifacts as a result of study. When I met with this teacher to determine student areas of weakness, she expressed concern over their inability to use search terms effectively to find relevant information on their authors. She was also concerned about their approach to research using academic databases versus a search engine, their misunderstandings surrounding ethical use, and their confusion about bibliographies. We decided to touch on all of these areas during the unit and designed two lessons to meet those objectives. We met several times to discuss the sequence of the lesson as well as division of responsibilities prior to instruction. Overall, the two lessons went very well, and students seemed receptive to the different perspectives on research we offered them. I graded both students' website credibility worksheets and their bibliographies to assess their mastery of student objectives, and I also consulted with the teacher on how to improve the lesson for next year. I used a OneNote class notebook section to host my curated resource list for this lesson as well as several additional instructional materials. The full OneNote section can be viewed by clicking here.